1) Cleveland Browns: Sam Darnold, QB, USC. After trading out of the spots where Carson Wentz and DeShaun Watson were drafted the last two years, the Browns finally take a quarterback of their own in the first round with the No. 1 pick. 2) New York Giants: Saquon Barkley, RB, Giants. There's little doubt Barkley will be a good (possibly great) NFL running back, and I'll even bet that the "Taking a running back this early is a great idea" crowd will have their brief day in the sun when Barkley has beastly moments. Ten years from now, however, my bet is that people will look back at the 2018 NFL Draft and wonder what could have been if the Giants took [fill in the name of one of these other first round quarterbacks]. 3) New York Jets: Baker Mayfield, QB, Oklahoma. I personally think that Josh Rosen is the best quarterback in this class, but Mayfield has been linked to the Jets for months, so I'll refrain from getting too cute with this pick. 4) Cleveland Browns: Bradley Chubb, DE, North Carolina State. In an otherwise weak edge rusher class, Chubb stands out as the clear-cut best of the group. Paired with Myles Garrett, the Browns will suddenly have a pair of edge rushers who will be difficult to block. 5) Denver Broncos: Josh Rosen, QB, UCLA. While most observers don't share my thinking that Rosen is the best quarterback in this class, most agree that he's the most "pro-ready." On a Broncos roster that is still pretty good (the quarterback position aside), a pro-ready quarterback could conceivably make Denver contenders again in the shaky AFC West, unless of course they think Case Keenum is winning them a Super Bowl, in which case just fire everybody. 6) Indianapolis Colts: Roquan Smith, LB, Georgia. I really struggled with this pick, since the Colts have holes everywhere. I also considered offensive line help here, but the linebackers in this class are loaded at the top, while a good offensive lineman can probably be had early in the second round. 7) Tampa Bay Buccaneers: Minkah Fitzpatrick, CB/S, Alabama. Fitzpatrick is a playmaker who can play anywhere in the secondary. The Bucs will need to figure out what to do with him. Is he an outside corner? 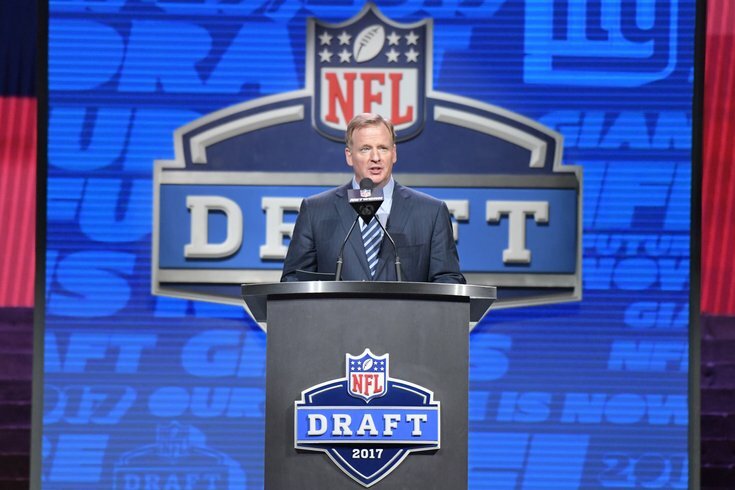 Do you want to spend the seventh pick on a safety? Whatever the case, Fitzpatrick is stud. Just go get him. 8) Chicago Bears: Quenton Nelson, OG, Notre Dame. "The Bears' OL coach coached Nelson at Notre Dame," is what every other mock draft will say, and so will mine. 9) San Francisco 49ers: Tremaine Edmonds, LB, Virginia Tech. With Reuben Foster's laundry list of missteps piling up, the Niners grab one of the many highly talented linebackers at the top of this draft. 10) Oakland Raiders: Denzel Ward, CB, Ohio State. The Raiders as a team had five interceptions last season. Five. Ward joins former OSU teammate Gareon Conley in the Raiders' secondary, forming a potentially really good young duo. 11) Miami Dolphins: Vita Vea, DT, Washington. The Dolphins will have to replace some of Ndamukong Suh's ridiculous 883 snaps in 2017, and Vea falls right into their laps. 12) Buffalo Bills: Josh Allen, QB, Wyoming. There's a thinking that Allen's strong arm will fit well in the rough weather up in Buffalo. I can buy that logic, though I do think the Bills will have to move up from this spot to get him. 13) Washington Redskins: Derwin James, S, Florida State. The Redskins are the biggest beneficiaries of the early run on quarterbacks, as they sprint this pick up to the podium. 14) Green Bay Packers: Jaire Alexander, CB, Louisville. The Packers kind of tipped their hand when they tried to sign Bears CB Kyle Fuller to an offer sheet that the Bears matched. In other words, they're still looking for a corner, and Alexander is worthy of this slot. 15) Arizona Cardinals: Lamar Jackson, QB, Louisville. The Cardinals have no idea what they're doing, as evidenced by the asinine $20 million contract they handed to Sam Bradford this offseason. Anyway, they still need a quarterback, and Jackson is the last one worth taking in the first round. 16) Baltimore Ravens: Calvin Ridley, WR, Alabama. Ozzie Newsome has drafted Alabama players with his first pick in three of the last six years. He goes back to the well again with a need pick at wide receiver. 17) Los Angeles Chargers: Mike McGlinchey, OT, Notre Dame. Joe Barksdale struggled at RT for the Bolts last season. McGlinchey fits in neatly at that spot. 18) Seattle Seahawks: Kolton Miller, OT, UCLA. Reach? Maybe. OK, probably. But OT is a huge need for the Seahawks and Miller is the SPARQiest of the offensive linemen in this draft. 19) Dallas Cowboys: Courtland Sutton, WR, SMU. With Dez Bryant gone, the Cowboys reach for a wide receiver, because they're dumb. 20) Detroit Lions: Da'Ron Payne, DT, Alabama. There was a noticeable difference in the Lions' run defense before and after Haloti Ngata's injury last season, and the Lions need to get that fixed. I'd be very surprised if Matt Patricia didn't get a defensive player to build around, and Payne can be the strong interior lineman who does the dirty work that makes everyone else look better. 21) Cincinnati Bengals: Frank Ragnow, C, Arkansas. The Bengals' rushing attack was horrendous in 2017. Ragnow gives the them some direction at center, and apparently the Bengals' radio commentator gets their pick right every year, so I'll just listen to him. 22) Buffalo Bills: Rashaan Evans, LB, Alabama. Sean McDermott got used to watching his linebackers in Carolina affect games. In Buffalo, he finds a backer with high upside in Evans. 23) New England Patriots: Marcus Davenport, DE, UTSA. Davenport will probably go earlier than this, but I can't see how he gets past the Patriots if he's still on the board here. The Pats' pass rush struggled to generate pressure on the quarterback last season, and it was part of the reason their defense got carved up in the Super Bowl. 24) Carolina Panthers: D.J. Moore, WR, Maryland. Cam Newton has to be looking at his current receivers (Torrey Smith and Devin Funchess) and throwing up in his mouth. Moore, a Philly native, gives him an immediate contributor in the slot, with the ability to also play on the outside as the Panthers continue to address their receiving corps. 25) Tennessee Titans: Harold Landry, Edge, Boston College. Landry has an outstanding dip and bend around the edge. With talented interior linemen already in place, his edge presence should shrink the pocket for opposing quarterbacks. 26) Atlanta Falcons: Taven Bryan, DT, Florida. The Falcons badly need help on the inside to help their outside pass rush, and it's unlikely Bryan will be taken before this slot. 27) New Orleans Saints: Hayden Hurst, TE, South Carolina. Hurst will turn 25 years old before the start of the season, which will turn teams off. The Saints won't care, as they're in "win now" mode with Drew Brees' career winding down. Hurst fills an immediate and obvious need, and gives Brees another weapon in the passing game. From a height-weight-speed perspective, Leighton Vander Esch is arguably the most impressive defensive player in this draft. 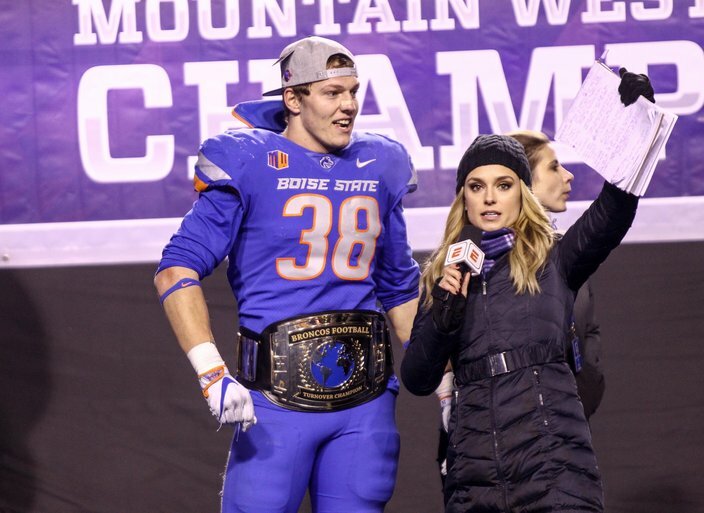 28) Pittsburgh Steelers: Leighton Vander Esch, LB, Boise State. A number of teams are reportedly worried about a neck issue with Vander Esch, and the Steelers are reportedly not among them. It's been a long time since the Steelers have been without an impact linebacker in the middle of their defense, but that's where they are with Ryan Shazier's devastating injury. 29) Jacksonville Jaguars: Will Hernandez, OG, UTEP. It's no secret that Jacksonville wants to run the football, as they led the NFL last season in rushing attempts and rushing yards. Hernandez is a mean, nasty human being who would complete their interior offensive line. 30) Minnesota Vikings: Isaiah Wynn, OG, Georgia. The Vikings are really going to struggle beating teams with good defensive lines in the playoffs until they get their offensive line fixed. Wynn played tackle at Georgia, but he projects to guard in the NFL. He'll patch one of their many holes along their line. 31) New England Patriots: Mike Hughes, CB, UCF. As you all saw in the Super Bowl, the Patriots' corners got roasted all night after Bill Belichick infamously benched Malcolm Butler, who is now with the Titans. 32) Philadelphia Eagles: Connor Williams, OT, Texas. I believe the Eagles will trade out of this pick, but if they draft a player with the way the first round played out above, I think the pick would be Williams, who has outstanding athleticism, and at one time was thought of as a top 10 pick. After a down 2017 and concerns over his short arms, teams are going to be concerned about his ability to play tackle in the NFL. If Williams pans out as a tackle in the NFL, great. If not, I believe his floor is as an athletic quality starting guard or center. Either way, he's a nice fit on the Birds' roster.